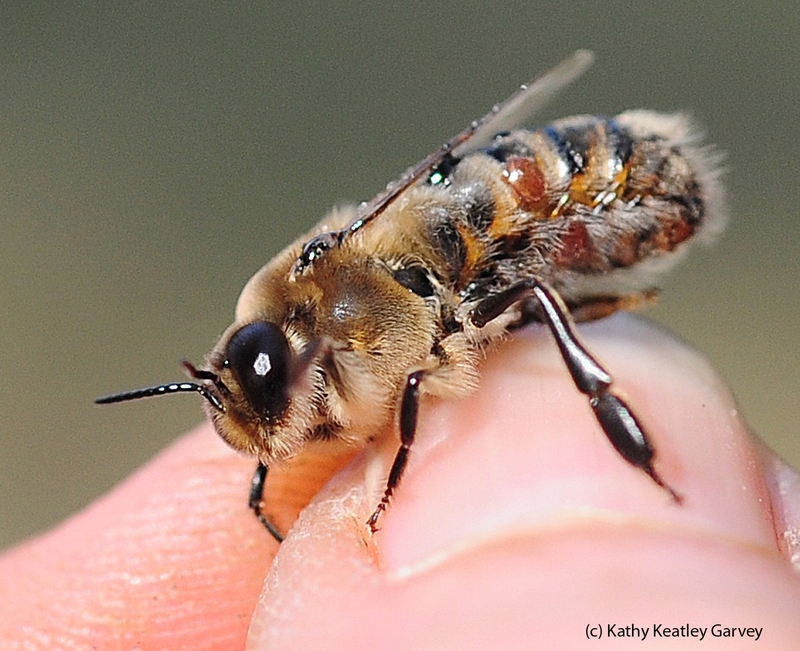 Drones--remotely piloted aircraft used in reconnaissance and target attacks--are in the news, but so are the other drones--male bees. This time of year drones are as scarce as the proverbial hen's teeth. They're not needed in the hive now--just extra mouths to feed--so their sisters are booting them up. They're basically evicted, cold and shivering, from the hive. 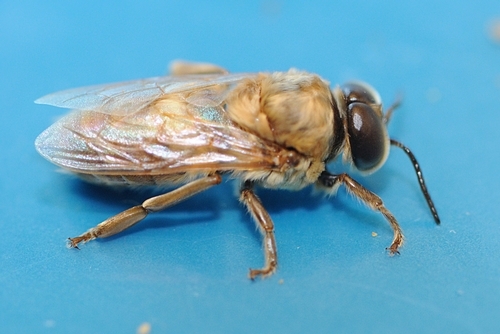 Drones are easy to identify: big eyes, bulky body, and lumbering movements. It's best to be a drone in the spring. When a virgin queen goes for her maiden flight, a group of drones will mate with her in the drone congregation area. The drones die shortly after mating. If they don't mate, then they'll die before winter sets in. As Extension Apiculturist Eric Mussen of the UC Davis Department of Entomology faculty says: First the sisters stop feeding their brothers so they're easier to push out. The sisters have no pity. 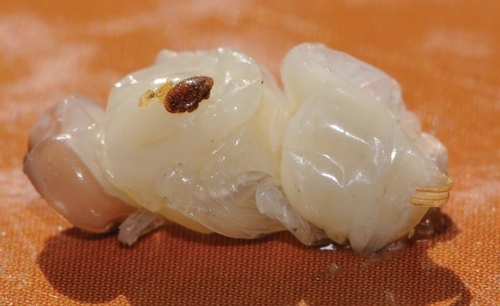 It's not a pretty sight--the Varroa mite attacking a honey bee. 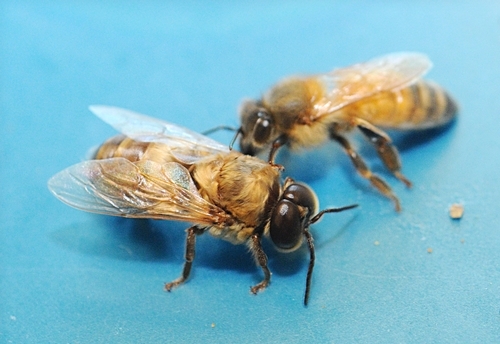 Beekeepers are accustomed to seeing the reddish-brown, eight-legged parasite (aka "blood sucker") in their hives. UC Davis bee breeder-geneticist Susan Cobey, manager of the Harry H. Laidlaw Jr. Honey Bee Research Facility on Bee Biology Road, is among those who've declared war on the mites. She's carrying out an intensive and comprehensive breeding and selection program aimed at developing honey bees that are resistant to pests and diseases. 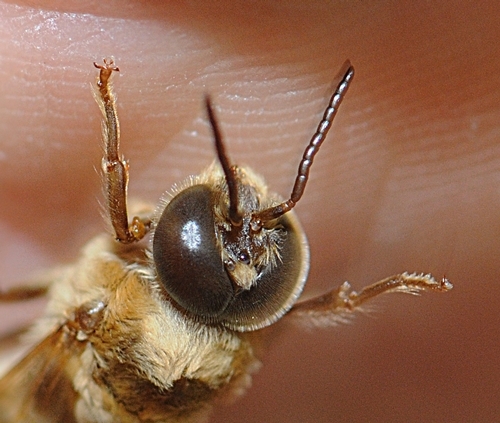 The Varroa mite is a serious pest of honey bees worldwide, spreads diseases, and can weaken and destroy the colony. 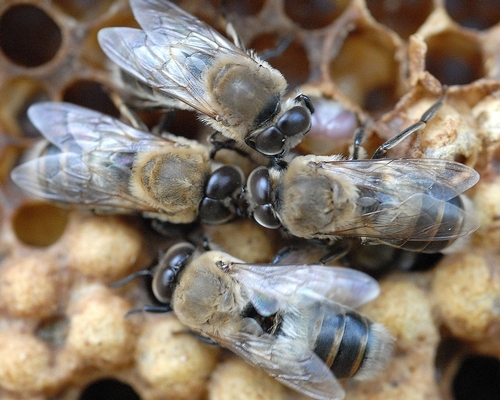 It is no doubt one of the culprits involved in colony collapse disorder, a mysterious phenomenon characterized by honey bees abandoning the hive. 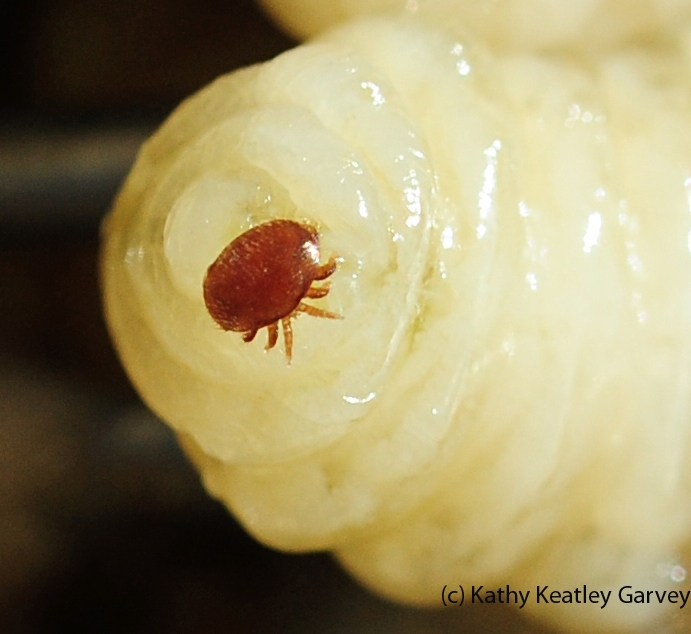 Here's what the Varroa mite looks like attacking an immature bee.